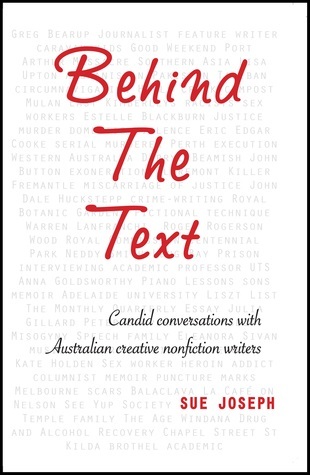 Behind the Text: Candid conversations with Australian creative nonfiction writers could be the perfect Christmas present for readers of all kinds, and possibly even non-readers too. It is published by one of Melbourne’s small indie publishers (who recently published the joint winner of the Prime Minister’s Literary Awards History Prize Let My People Go, the untold story of Australia and the Soviet Jews 1959-1989 by Sam Lipski and Suzanne D. Rutland) but despite this prestigious honour I am not surprised that Behind the Text doesn’t seem to have caught the attention of old media reviewers yet because they are not very good at knowing about the gems that can be found among the books published by small indie publishers, IMHO. I have been reading an interview each day over breakfast and had read the interview with Paul McGeough (which is riveting); the one with Doris Pilkington Garimara (which is poignant); and I skipped the one with David Leser (because I’d never heard of him). (Perhaps I should be embarrassed about this but I’m not. He writes for newspapers I don’t read and (apparently) biographies of people I’m not interested in. I will come back to him later when I have read the others because now I’m sure that Sue Joseph can make him interesting). Holden spent eight months walking the streets as a prostitute, had a break, then went back on the streets. She then worked in two brothels – and was sacked from both. How could you not love the authenticity, courage and humour of this book?! Ahead, there are interviews with writers I’ve reviewed on this blog: Margaret Simons (one of my all-time favourite journalists); and Anna Goldsworthy (author of Piano Lessons) and more. This is a terrific book, offering more than a glimpse of the real people behind the books and articles we read all the time. Sue Joseph is obviously a highly skilled interviewer who treats her subjects with great respect and yet provides a revealing story behind the names we know. Or direct from the publisher, or from good bookshops everywhere. So glad you liked it! We think it’s a great read. *chuckle* I read the next chapter (about John Dale) over a long, lazy lunch… no wonder I never get any housework done! Sounds great, and yes, skip those writers who work for Satan. I’m meant to be working xmas day, but I’ll make time to click on you so you get a stat. Kate Holden talks about the ‘five unpublishable novels you write in your twenties’ (unless you’re Christina Stead) and it rings a bell – the first novel is often bursting with ideas, but after that the author needs hard work and perseverance to avoid being one of those one-hit wonders we were discussing the other day. PS Will click on you too, on Xmas Day, LOL maybe if we all network (and remember our promises, after the Xmas drinks) we can reach 10 for the day? Thanks for help with the Christmas list, Lisa! This might have to be one for myself, though. I hadn’t heard of David Leser either when I listened to him speak at the Margaret River Readers & Writers Festival a few years ago. On the strength of that, I bought ‘To Begin to Know”, his biography of his father and I enjoyed the book. Not at all what I was expecting. It was indeed a brave biography – he started when his father asked him to do it, then stopped, then restarted many years later for reasons of his own. Thank you so much. (And I loved the review you wrote of ‘Georgiana Molloy’! )Yes, another manuscript finished last week. Historical fiction this time. His father asked him?! That’s a brave father too, then, unless he was quite confident that he could censor the finished product if he wanted to.